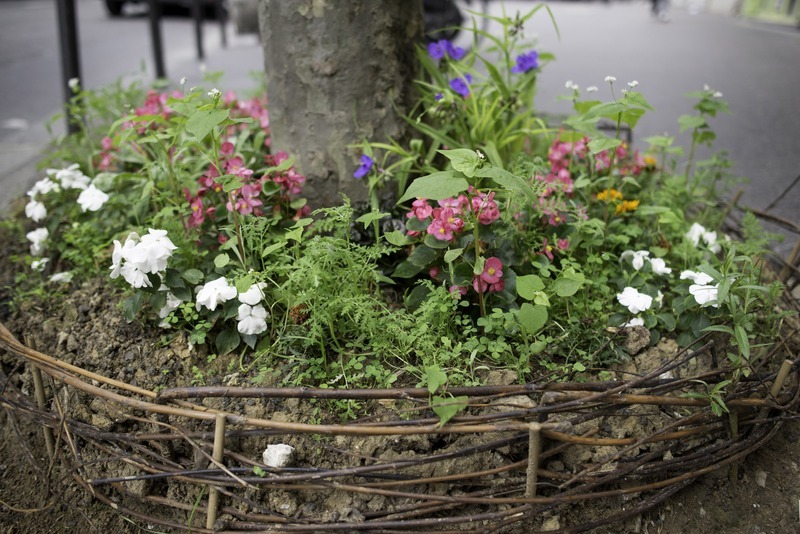 Gardening in the streets of Paris? That’s allowed! 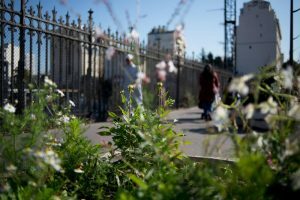 Since June 30, 2015, the Paris Greening Permit has provided 2500 people with an opportunity to get involved in greening the city. 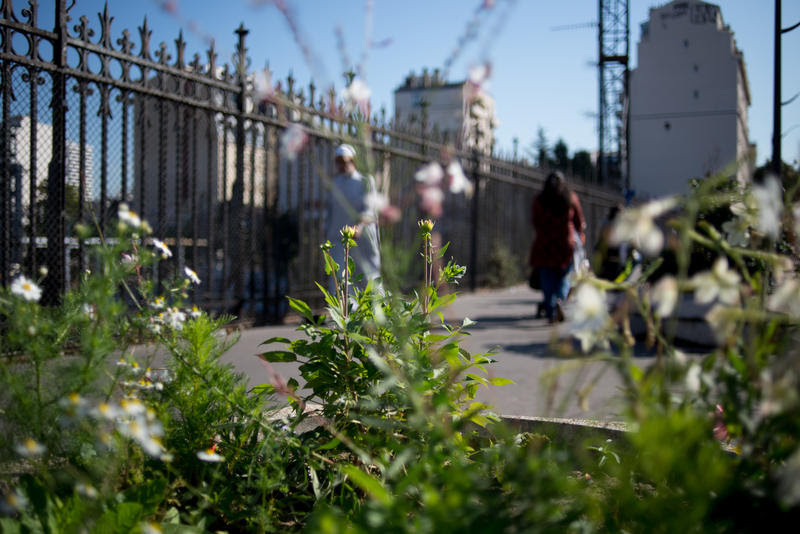 Thanks to this new programme, every Parisian can become a gardener for a local, otherwise barren, site of their choice. There are almost no limits to the scheme. Locations have been found in all kinds of public space: Under trees, on rooftops, quiet spots by fences and walls – all ideas are welcomed. 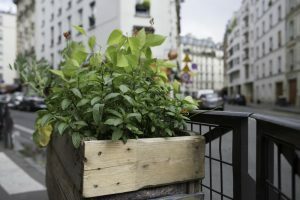 The idea is that by installing window boxes to grow tomatoes, or by using bare earth by a tree trunk to grow flowers, or by planting a climbing plant on a wall, people can combine their efforts to green the whole city. 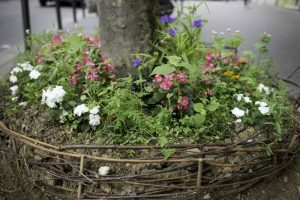 The Greening Permit is not available for private spaces: if Parisians want to do something in their private building courtyard, they can go ahead with greening of course. And if they want to do a project in a private place they do not own, they will have to contact the owner. Public open spaces like parks and squares are not covered by the permit. The scheme is aimed at public space not maintained as greenspace. In order to pursue a project, Parisians must gain prior authorisation from the City of Paris. Permits can be applied for on line. The application includes a few questions, including the identity of the applicant, the location of the proposal and a description of the project. They also have to agree to a few conditions. Advice is provided on locally appropriate plants (there is a list provided on the website). Licensees must maintain their project and must not use pesticides. If the City of Paris agrees to the proposal, applicants receive their permits and can put their projects in place. Each permit is valid for 3 years and can be extended for up to for 12 years. The City also provides gardeners with seed and soil for their project. If people need advice or want to learn about gardening, they can go to a ‘Gardening House’ where professional gardeners are available to help. In addition, meetings are organized to talk about projects, innovative ideas and sources of finance. This report means that councillors must be prepared to step back from local projects and offer advice and support rather than strong leadership. One example the report identifies is in Kent: the project is resident-led, but Cllr Vince Maple of Medway Council used his position within the council to provide the group with the confidence, resources and knowledge they needed to get started. The group built parks; and residents, who were sceptical at first, volunteered to maintain it because ‘they felt ownership of the space in a way that they may not have if it had been a council-run space.